1876 Gentleman’s Farm Estate 110 Acres! Horse Property! 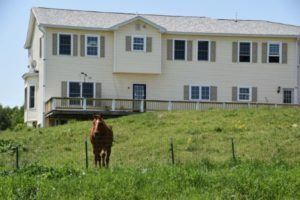 !$899,000 Bedrooms: 6 Baths: 6 Full, 2 Half Lot: 110 Acres Sq Ft: 5,326 Year Built: 2004 Basement: Full, Finished, Walk-Out with Separate Apartment Hover over each image to view larger images. Welcome to Rolling Acres Estate – an income producing Gentleman’s Farm! Work, play and live in your own private slice of heaven, tucked away from the hustle and bustle, yet not too far to take a quick trip into town. You will be amazed by all of the possibilities that 110 acres of beautiful, open fields combined with lush wooded areas has to offer. 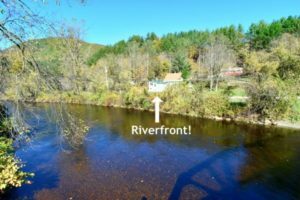 Riverfront on the Battenkill River! Enjoy fishing, kayaking and canoeing from your own boat launch! This 6 bedroom 2.5 bath property has many uses – Live in one side and rent the other or operate your business from one side while living on site. 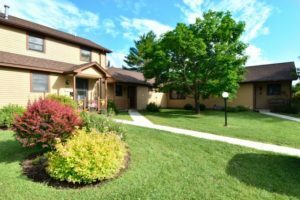 Perfect for families who want to give their college student some independence yet be close by or keep as an in-law apartment or guest suite. Great for investors – rent two sides residentially or use as mixed use commercial space. Driveway can easily fit 20+ cars. Easy walking distance into downtown Arlington just half a mile from town. Large grassy lawn area with beautiful views of the river and mountains. 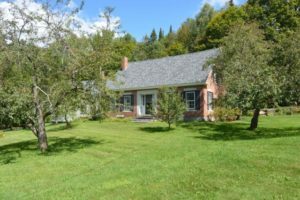 Vintage farmhouse on 7.9 stunning acres adjoining the Brandon Brook with the White River just across the road is perfect for a fishing or skiing retreat! 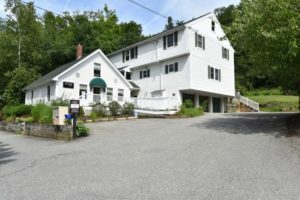 Located within a short drive to Killington, Pico, Sugarbush, and Mad River Glen ski resorts and just a 4.5 mile drive to picturesque and charming downtown Rochester. Encircled by the Green Mountain National Forest, this area is loaded with spectacular views and wildlife. Enjoy hiking and snowmobile trails nearby with easy access to the VAST trail network. 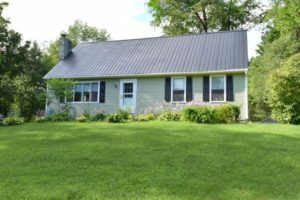 Double A-Frame on 2.5 Acres Just 2.5 Miles to Smuggler’s Notch Ski Resort!$180,000 Bedrooms: 3 Baths: 1 Basement: Full, Walkout Garage: 1 Car Detached Lot: 2.5 Acres Sq Ft: 1,382 Year Built: 1973 Hover over each image to view larger images. 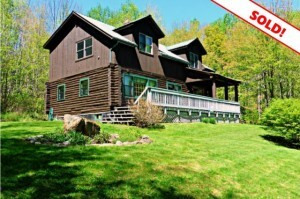 Double A frame just 2.5 miles to Smuggler’s Notch Ski Resort! Perfect location for a ski home or Air BnB. Gorgeous chalet feel with vaulted wood ceiling. Wood stove to enjoy on those snowy winter nights. Large deck just screaming out for a hot tub to enjoy the breathtaking autumn foliage and relaxing after skiing. 2.5 acres to play on! Potential to refinish walkout basement into a separate apartment for additional rental income. 1876 Village Home on 1.75 Acre with Wrap Around Porch!$147,155 Bedrooms: 3 Baths: 1 Basement: Yes Garage: 2 Car Detached Lot: 1.75 Acres Sq Ft: 1,859 Year Built: 1876 Hover over each image to view larger images. Located at Addison Four Corners next to the church, this property would make an ideal location for a home business. Walk to Addison Central School and Dead Creek Wildlife Visitor Center. Just 8 miles to the Champlain Bridge for easy access to New York. Riverfront on the Battenkill! Roughly 1,000 feet of gorgeous river frontage with rocky beach area and breathtaking mountain views. Fish, kayak, or canoe right from your property! Water is deep enough in some spots to use as a swimming hole. 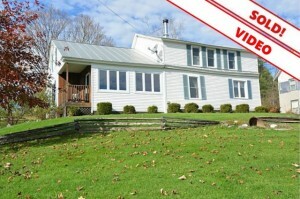 Fantastic location just a few doors down from the covered bridge and village of East Arlington. 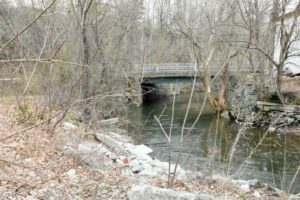 Amazing 44 acre property in Shaftsbury Forest with over 500’ of frontage on Little White Creek! 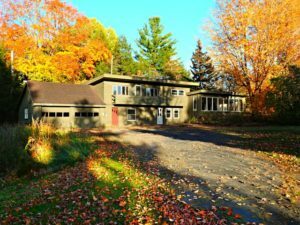 Exciting opportunities for trout fishing, hiking, cross country skiing, and ATV riding all on your own property! Recreational amenities galore! With a few springs on the property you could even build your own pond!! Imagine stream, pond, stone wall, horses and breathtaking mountain views – your own little slice of heaven. 1876 Lake Bomoseen Views and Lake Access!$185,000 Lot: 4.0 Acres Hover over each image to view larger images. 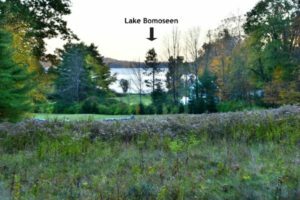 The best of both worlds – a gorgeous 4 acre building lot that has woodlands and an open meadow with Lake Bomoseen views is set back from the hustle and bustle of the lakefront. 30 feet of lake frontage as well as a community dock. 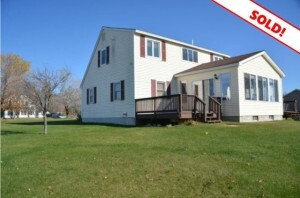 This property is build ready with survey, septic approval and power at the property. Very little site work needed to build the home of your dreams. Located at the largest freshwater lake in Vermont, you can find scarlet tanagers in your woods or watch the deer on your lawn. 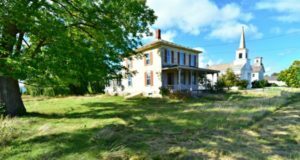 1876 Village Home on 1.75 Acre with Wrap Around Porch!$17,500 Lot: 3.9 Acres Hover over each image to view larger images. Outdoor enthusiasts! Build your dream home in established Snow Mountain Farms neighborhood. Located half way between Stratton and Mt. 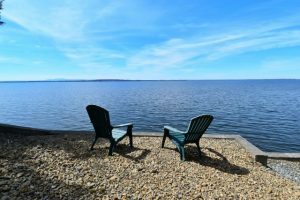 Snow ski resorts, this is a location of unlimited outdoor activities such as hiking, birding, snowmobiling, and enjoying beautiful Grout Pond in the summertime for swimming, fishing, kayaking, canoeing, and paddleboarding. Enjoy the thousands of acres of Green Mountain National Forest, The Long Trail, and VAST trail. Spectacular gourmet kitchen with island, pantry, pull out drawers and a large dining area. Formal dining room or den has a cozy wood stove. Extra spacious 25′ living room presents lots of options. First floor bedroom is perfect for guests. Master bedroom has a 12 x 6 walk-in closet. Gorgeous barnboard bath with double jacuzzi bathtub. Convenient first floor mudroom and office. 40 x 20 barn and shed with electric. Gorgeous property backing to open space offers a variety of wildlife to enjoy! New Kitchen and Gorgeous Sunroom! – Georgia – SOLD! Best in Home Performance Award from Efficiency Vermont 2012! Gorgeous new kitchen in 2013 with hickory cabinetry, granite countertops, tile backsplash, pull out drawers and ceramic tile flooring. Spectacular four season sunroom with full walls of windows overlooking vast yard and conservation area. First floor bedroom and full bath are perfect for guest or can make an ideal home office. Elaborate master bath with jacuzzi tub and triple window with stunning view of the yard. Foreclosure in Great Condition Just Steps from Town! Stowe – SOLD! Foreclosure in great condition! 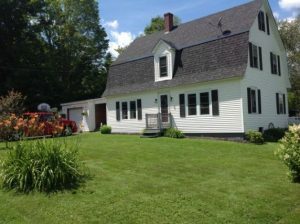 Excellent price and location just steps from downtown Stowe village. Bright and spacious unit offers third floor master bedroom with vaulted ceiling and skylights! Two second floor bedrooms adjoin a shared full bath, are large sized, and have good closet space. There are plenty of large closets including large entry and linen closets. Locked storage area in basement level adjoining shared garage. 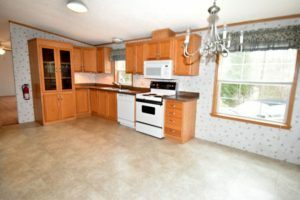 Oak kitchen with ceramic tile flooring has a breakfast bar and is open to the dining area. Spacious living room with beautiful view of wooded backyard. Relax on the back patio and enjoy nature. Immaculate home in like new condition. This 2004 home is so clean that it looks like it has never been lived in. Nicely set on a private .71 acre property, this home is just a short walk to the Springfield High School, market, and one mile to downtown. Just a 40 minute drive to Dartmouth Hitchcock Medical Center. 19 x 13 eat-in kitchen with oak cabinetry, built-in china hutch, and large pantry in addition to an extra wall of cabinets. Oversized windows let in bountiful natural lighting. Spacious 20 x 16 living room with attractive stone wood burning fireplace with oak mantle and ceiling fan has abundant natural lighting. 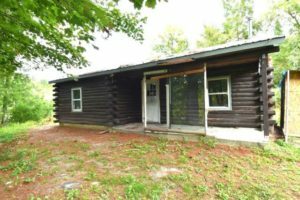 Nice Foreclosure Property with Seasonal Views of Lamoille River! – Johnson – SOLD!!! 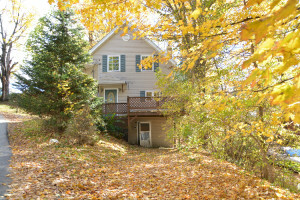 Foreclosure in Johnson Village with partial winter views of the Lamoille River just a few hundred feet away. 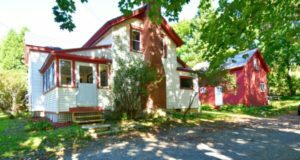 It is located on a quiet street with just a few other homes and an abundance of trees lending a quaint country atmosphere. This four bedroom home is quite spacious at 1,200 square feet plus a full walk out basement. There is a 12 x 12 deck on the front of the house to enjoy nature from. There is plenty of storage with large closets. Vinyl siding and metal roof help to make this a low maintenance home. Located just a short walk to Johnson Elementary School and Johnson State College. 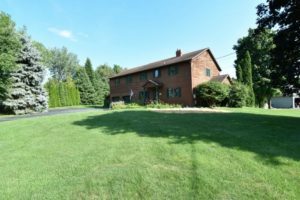 5 Bedrooms on Half Acre Property! New Kitchen! Barre Town – SOLD!!! Gorgeous gourmet kitchen with cherry cabinets, island, recessed lights, wood floor and copious cabinets and counter space. Formal dining room with Fisher wood stove and brick wall. First floor bedroom next to bath – perfect home office or bedroom for elderly. Four bedrooms upstairs with a huge 35 x 16 walk up attic – perfect for finishing into additional living space. First floor laundry room / mudroom. Full basement with high ceiling. Oversized tandem garage (29 x 12) with 9 x 8 workshop area. Spectacular .56 acre property with 24′ swimming pool, picket fence, 16 x 8 shed, children’s playset and separate fire pit area. Roof 2013. Covered porch. Backyard is only partially fenced. Just Listed! Immaculate Condition – As Clean as New Construction! – Barre Town – SOLD!!! Ultra clean home – so clean that it looks and feels like new construction!Stunning gourmet kitchen with island, solid oak cabinetry, granite countertops and stainless steel appliances. Spacious living room with great natural lighting has seasonal mountain views. 26 x 20 family room with Hearthstone soapstone wood stove is perfect for a game room or movie room. Beautiful newer solid oak staircase is a showpiece from the large entrance foyer. Two very spacious baths one with skylight and one with double Jacuzzi tub. 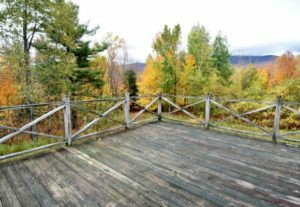 24 x 18 two level deck is perfect for enjoying the peacefulness of the 1.39 acre property which is both wooded. Live on the Prettiest Road in Vermont! – Warren – SOLD! 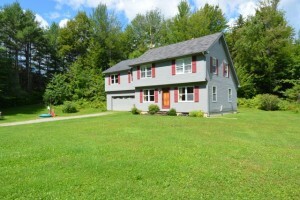 1372 Lincoln Gap Road, Warren, VT Live on the Prettiest Road in Vermont! Lincoln Gap Road is famed for it’s spectacular beauty. This road is locally referred to as ‘The Gap’ road and is a favorite of tourists and locals alike to drive, bicycle, motorcycle or hike for it’s breathtaking views and splendor. It is particularly popular during our spectacular foliage season. This home is close to The Long Trail and it’s heart stopping view from Sunset Rock. You are also just a few minute drive to both Sugarbush and Mad River Glen ski resorts and Sugarbush Golf Course. 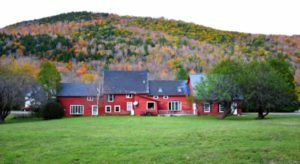 You could live right here in the middle of Vermont’s playground! Beautiful home in exceptional neighborhood! Located at the end of a cul-de-sac on a quiet street and backing to woods, this home has many recent updates. Beautiful eat-in kitchen with 42 inch cabinets, pull out drawers, and two lazy Susan cabinets in addition to a two month old high end Samsung fridge, modern flat top electric range, dishwasher and microwave. Spacious living room offers large picture window to let in plenty of natural lighting as well as a gas fireplace with mantle. Two family rooms – one with a new pergo ‘dance floor’ that is perfect for aspiring dancers. Lower level home office could be converted to a fourth bedroom. Premier location at end of cul-de-sac just four miles from downtown Montpelier. Many recent updates including new furnace and flooring (2014). Massive 27×25 addition over garage with vaulted and beamed ceiling already framed and wired for your new master suite or bonus room. Lovingly cared for and in very good condition. This home has extensive gardens with a wide variety of landscape plantings and berry bushes. Open and wooded property with stone wall. No neighbors across street and only two more houses at end of cul-de-sac make for a very peaceful and private location. Brooklyn Heights Home w/Great View Walking Distance to Amenities! 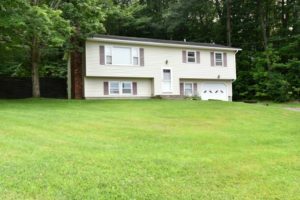 Morrisville – SOLD!!! Two spacious bedrooms offers ample closet space sporting 9′ and 6′ closets with lights. There is also a 4′ closet in the entryway as well as a good sized linen closet in the hall. This home has no lack of storage space as there is a massive basement ‘crawl space’ area which runs the entire length of the home. The crawl space is about 5′ high. The large laundry room has a new stackable washer and dryer as well as access to both the attic and basement areas. Painted in March 2017 with neutral beige paint and new baseboard heating throughout. Energy efficient – heating bill for 2016 was just $910. Cozy log cabin close to Johnson State College, village shops and dining. 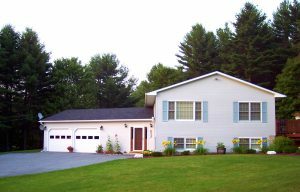 Centrally located to Smuggler’s Notch and Jay Peak ski areas with many hiking trails nearby. Just a short walk to the Gihon River and covered bridge. 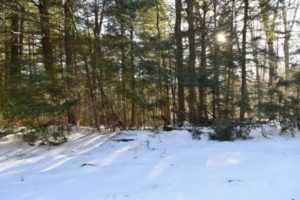 Close to Lamoille Valley Rail Trail for bicycling and snowshoeing. Near Old Mill Park with it’s beautiful mountain views, soccer and baseball fields, swing sets and path around the 20 acre park. Private yard with plenty of room for a garden. Town water and sewer. Very affordable home, rental, or vacation get away. Own for less than the cost of renting! Spacious and modern colonial with a contemporary flair is in immaculate condition. Everything in this home bespeaks quality – from the gleaming hardwood floors to the lavishly updated master bath with heated towel rack, heated floor, stylish vanity and luxuriously oversized shower. The 1.1 acre property is meticulously maintained with manicured lawn, goldfish pond with stone surround and lovely landscaping and gardens. The patio and back porch are perfect for relaxing and enjoying the scenic view. You can enjoy the hot tub all four seasons from the enclosed porch. The modern kitchen with custom cabinetry and granite countertops is very appealing. 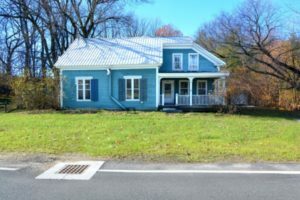 133 Paine Avenue, Morrisville – SOLD!!! Expansive property with a lot of square footage for the price. House feels sturdy and appears to have good ‘bones’, however needs a lot of cosmetic work. Property may need mechanical and system work – unknown at this point. Town clerk said that property could possibly be subdivided into additional lots. Very spacious great room with stone fireplace, modern sunroom, large bedrooms and two bonus rooms. Master bedroom has an attached bath and sitting area. 33 foot balcony. Tons of closets and storage. 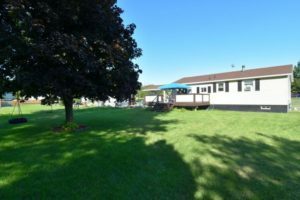 Large yard perfect for gardens. 20 x 29 garage could easily fit four cars. Garage has a huge loft area with ladder access. Delightful neighborhood with well maintained homes. Spectacular Sunset Views of Lake Champlain – Georgia – Sold!